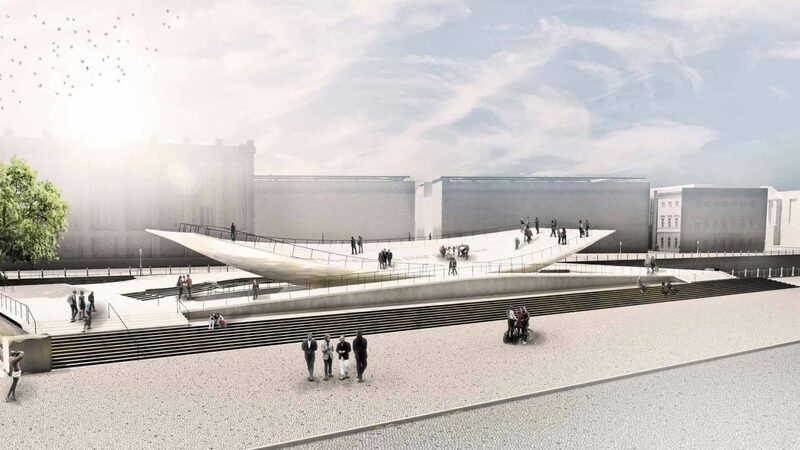 The concept for the National Monument to Freedom and Unity in Berlin, designed by Milla & Partner, is titled „Citizens in Motion“. A message that Milla & Partner convey in an unexpected manner. The monument is animate and is not to be approached merely as an object for contemplation - the intention is that people shall actually enter it and walk on it and set it in motion, movement being achieved by visitors working together as a group. The design was created in a spirit where, by means of creative action, individuals are enabled to bring benefit to the community and as a consequence shape society. The visitors themselves - the citizens who set the whole in motion - become an active part of the monument. The vision is that it will be an aesthetically ambitious, continually changing choreographic expression of the Peaceful Revolution of 1989. 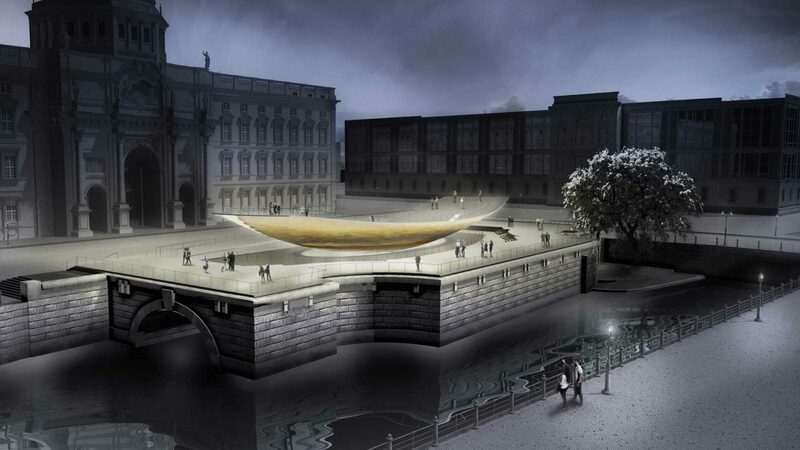 The monument is a dynamic object that will be moved in slow motion by visitors. It is unique in form, content, interaction principle and its technological challenges. This requires extensive testing on a 1:1 scale. 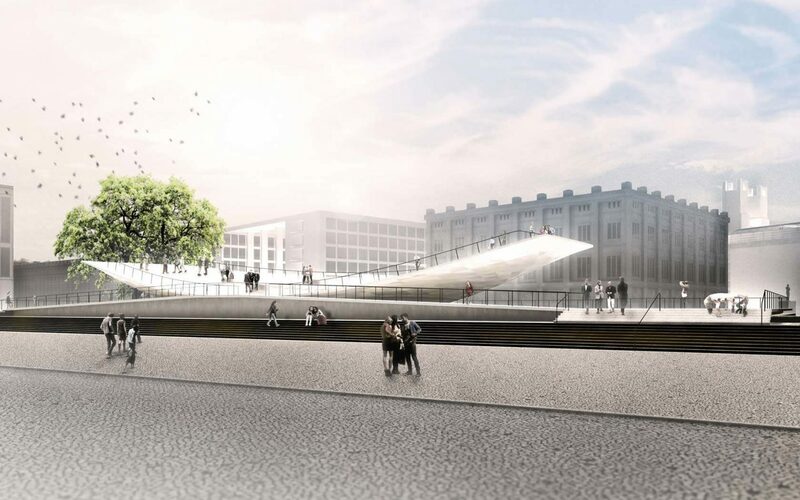 In 2011, our plans in terms of gradients and the speed of movement of man and object were tested on a drawbridge in Mannheim which has almost identical dimensions to those of one half of the monument. In 2013, further lont-term testing took place: the surfaces of the monument, the angle of inclination, the accessibility and impact for the visitors were tested on the basis of a 1:1 earth model: people of different ages, from different backgrounds and in diverse group-dynamic constellations strolled, walked, ran and filled the monument. "Forgetting - Why We Don't Remember Everything"
Milla & Partner´s Monument to Freedom and Unity, on show together with the artists Christian Boltanski, Jake & Dinos Chapman, Tacita Dean, Mark Dion, Sam Durant, Hans-Peter Feldmann, Ilya Kabakov, Arwed Messmer, Jana Müller, Adrian Paci, Regis Perray, Maya Schweizer, Tino Sehgal and Sigrid Sigurdsson. The current special exhibition at the Historical Museum Frankfurt sheds light on the diverse dimensions of forgetting via an interdisciplinary perspective. Causa Tagesspiegel: Kulturausschuss - übernehmen Sie! Stuttgarter Nachrichten: Eine Idee, zu groß für die Politik? Hipp, unfertig, frei, großartig. Ein Plädoyer für die Wippe. 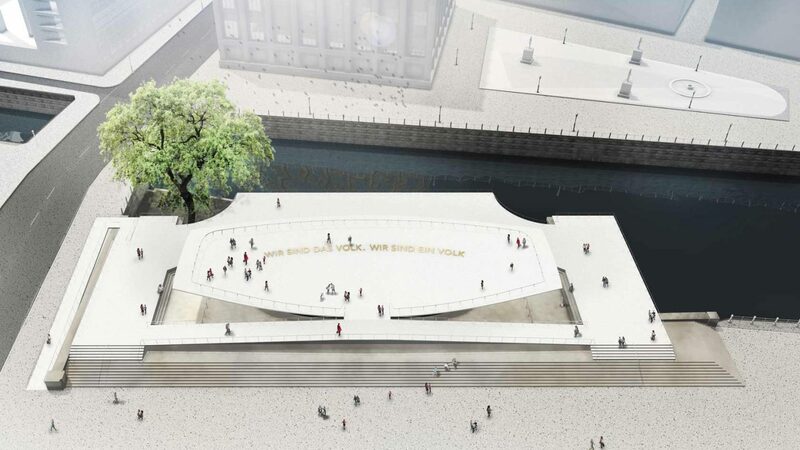 After more than a decade of disagreement, Berliners have settled on a monument to celebrate German reunification and the 1989 peaceful revolution: a giant, rocking dish. The 55-metre, 330-tonne glittering steel wing can hold up to 1,400 people at any one time, but it needs at least 20 people to get it moving.